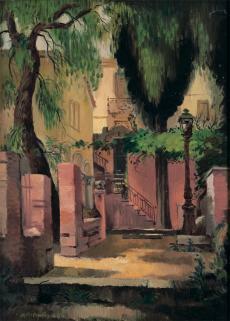 He studied at the Athens School of Arts (1915-1921). In 1930, he became a founding member of the ‘Techni’ group of artists; he was also amember of the ‘Stathmi’ group. He participated in the Venice Biennale (1934, 1940), and those of Sao Paulo and Alexandria (1959), as well asa large number of group exhibitions and national and international fairs. His book ?? ????? ??? ?????? ??? ????????? [The Schwartz house inAmbelakia], featuring prints inspired by his travels in Thessaly, was published in 1928. In 1935, he decorated with wall-paintings the monumentin Thessaloniki to the Serbs who died in Macedonia during World War I. He was also a religious painter, printmaker and mosaic artist. He taught in secondary and tertiary education. An exponent of the Generation of the ’30s, he combined in his works – mostly landscapes, as well as nudes, portraits and still-life paintings – purity of line and colour, and a flat, stylised approach.